The Right Honorable Stephen Harper, prime minister of Canada, has invited AHEPA Canadian President Nick Aroutzidis to participate on his official delegation to theHellenic Republic on May 28 and 29, 2011, announced Supreme President Nicholas A.
I would like to take this opportunity to welcome everyone to this meeting. AHEPA, as you know, promotes the ancient ideals of Hellenism, Education, Philanthropy, Civic Responsibility as well as Family & Individual Excellence. 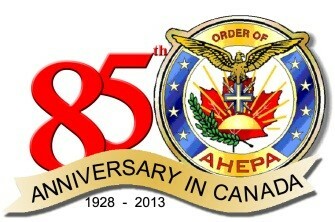 On October 28, 1928, AHEPA Supreme President George Philies started the first Canadian Chapter of AHEPA in Toronto. By 1938 AHEPA was coast to coast in Canada; serving the members, society, and leaving an incredible impression in each community in which we were engaged.